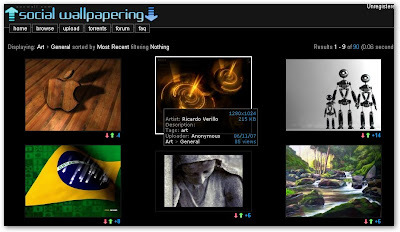 Social Wallpapering is a site for users to browse, classify, and download stunning wallpapers to use as background images for their desktop. It's extremely easy to upload and share your favorite wallpaper; be sure to select a category and compose a title for it along with an optional description and tags. Wallpapers on the site are broken down into dozens of categories and sub-categories like Space, Abstract, Fantasy, and TV and Movies. You can also view the most popular, highest rated, and most recent wallpapers. Mousing over a wallpaper thumbnail brings up its size and dimensions along with some descriptive text so you can easily find a wallpaper that fits your desktop. You can also rate each wallpaper using Reddit-like up-and-down voting buttons located below each thumbnail. The wallpapers have been assembled into four BitTorrent packs for easy downloading. Social Wallpapering also represents a unique take on applying the wisdom of crowds to filtering information. The creator of the site specifically cites Kevin Rose and Digg as the inspiration for the site, but he takes it further than most Digg clones. Most other sites that try to apply the same principle to different verticals end up copying Digg too closely by taking an off-the-shelf CMS like Pligg and failing to customize it enough. Social Wallpapering doesn't fall into this trap.